William Brady was born at Corvan, Ireland, in 1825. He emigrated to the United States and fought with the 2nd New Mexico Volunteers during the American Civil War. After the war he moved to Lincoln County where he was a close associate of two other Irish immigrants, James Dolan and Lawrence Murphy, the owners of the Murphy & Dolan mercantile and banking operation. In 1875 Brady, with the support of Dolan and Murphy, was elected as sheriff of Lincoln County. The following year Alexander McSween and John Tunstall set up a rival business to the Murphy & Dolan merchantile and banking operation. The business activities of McSween and Tunstall upset James Dolan and Lawrence Murphy. Dolan attempted to goad Tunstall into a gunfight. 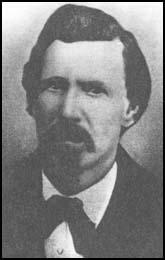 Tunstall refused to use violence himself but he did recruit Billy the Kid to help him in his business dispute. On 18th February, 1878, Tunstall was killed by William Morton, Jesse Evans and Tom Hill. This incident started what became known as the Lincoln County War. Billy the Kid joined the Regulators, a group that supported Alexander McSween. It was claimed that John Tunstall had been murdered on the orders of James Dolan and Lawrence Murphy and that Sheriff Brady had played an important role in organizing the killing. On 1st April, 1878, Billy the Kid and two other supporters of John Tunstall, Henry Brown and John Middleton, killed William Brady during a shoot-out. Billy the Kid was wounded and was later convicted of the murder.